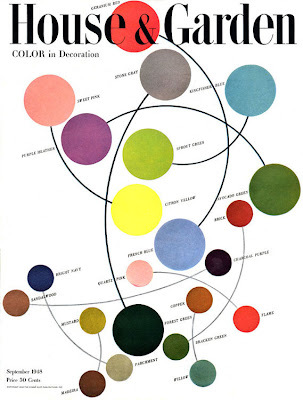 The September 1948 cover of House & Garden has a pretty outstanding collection of mid-century colors for painting. The list of their mid-century paint colors includes: geranium red, sweet pink, stone gray, kingfisher blue, purple heather, sprout green, citron yellow, brick, avocado green, French blue, sandalwood bright navy, quartz pink, charcoal purple, mustard, forest green, copper, madera, parchment, bracken green, flame and willow. I'm a fan of the stone gray and kingfisher together, but perhaps I'm a little biased.